When Lance Armstrong suddenly pleaded “no contest” last week in the USADA’s proceedings against him, my university’s communications office sent out a time-sensitive request to faculty members who might have some comment. I foolishly glanced at a couple of news reports on my iPad in the meeting I was in, and then tapped out a hasty 300-word comment on my way to another meeting. When I saw these “thoughts” in the form of an official press release later that evening, I was already a little embarrassed. And I have to admit, I found myself sympathetic with some negative reactions by e-mail and on the web from readers unfortunate enough to have received the release. So in place of those ill-advised 300 words, I offer more than 3800 below. I apologize now for both the initial 300, and for lacking the concision to say something useful within the normal confines of a blog post. There’s no good word for a sports fan’s emotional attachment to those rare athletes who seem to be playing at a different level from their competitors. You love/admire/are-in-awe-of/are-inspired-by them and their greatness. This emotion is especially pure in the case of those athletes-of-a-generation in individual sports — who remain on top for years, and only get better as they raise the quality of the entire field of competitors gunning for their crown. In our day we are talking about a smallish club that includes Tiger, Roger Federer, Michael Phelps, Oscar de la Hoya, Hicham El Gerrouj (the great middle-distance runner), Usain Bolt, Serena Williams, and Lance Armstrong. These monarchs of their sport were consistently better than the field — not because it ever seemed easy for them (although Serena does sometimes make it look rather easy), but because they seemed to be able to out-train, out-work, out-smart, and psych-out their rivals. It is an understatement to say that the era of performance-enhancing drugs (PEDs) has made this emotional attachment to athletic greatness more complicated. We love the great ones like heroes, and are deflated if the secret to their ultimate success involved cheating. Most of us are also strongly disposed to believe that they have not cheated. Cognitive dissonance works hard to spare us from that disappointment. Personally, I am mildly embarrassed by how long I held on to my belief that Barry Bonds was simply better than the rest because he worked out more. 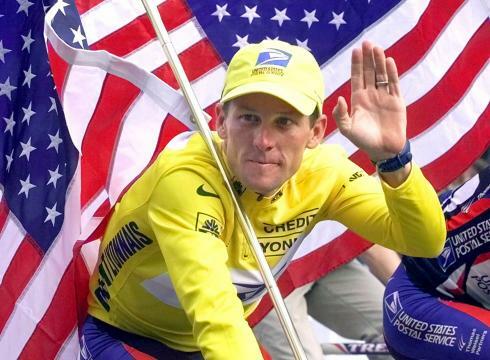 Floyd Landis, who was stripped of his 2006 Tour title for doping, and Tyler Hamilton, who admitted to doping and said he played a part in the Postal Service doping conspiracy, will also be a part of the antidoping agency’s case, the two people said. Of all those riders, Hincapie’s testimony might be the most damaging. In cycling circles, he is called Big George, a man who stands out in the peloton for his 6-foot-3 frame, and more so for his loyalty to the cyclists he has helped reach the top of the sport. He has made his living as a domestique, a worker bee who helps the team leader win by protecting him from the wind, from attacks by other teams, and from anything else that could get in the way of the top rider’s success. He has ushered three riders to nine Tour victories. What are we “outsiders” to think about either the case against Armstong, or of his case against the USADA’s “witch hunt,” as he calls it? (In dismissing Armstong’s suit, the federal judge found the USADA’s process to be “perplexing,” but nevertheless not showing “wanton disregard for its rules, to the immediate and irreparable harm of a plaintiff, where the plaintiff has no other available remedy.” Much of that information about the case and the process is readily available. None of us on “the outside” has a right to feel 100% sure, one way or another. Our certainty meter may have nudged up or down if we’d been able to marshal our intuitive psychology to interpret the testimony of the witnesses who would have testified against Armstrong. But we can’t even be sure which way. We would like to think we could recognize a kangaroo court, if that’s what it is; or the pained, reluctant, and incredibly compelling eye-witness testimony of former friends of the accused, if that’s how it would have gone down. I’ve reviewed as much of the evidence against Armstrong as I’m capable of digesting, and I share his conclusions. But witches do exist, and sometimes witch hunts uncover them. It’s not far from the realm of possibility that both of these statements are correct: Lance Armstrong is the victim of a witch hunt, and Lance Armstrong is guilty of using PEDs. I don’t know the truth. Neither do scores of journalists whose opinions on the subject are everywhere, shaping public opinion. Barra goes on to find some grounds for skepticism or inconclusiveness about several well-known tales of supposed eye-witnesses and of supposedly incriminating drug tests. So what are we to make of all this? As outsiders, neither camp — those who believe and don’t believe Armstrong is telling the truth — is entitled to feeling as certain as they seem to feel. We could all say at this point, “why should we care? why not just leave the man alone? he’s endured enough.” But that ignores one of the most unique and compelling aspects of the Lance Armstrong phenomenon. Most of what is most inspiring about Armstrong happened off the bike: his tireless passion to raise fabulous sums — as much as half-a-billion dollars — for charity. And he did this by leveraging his brand, his reputation, his integrity, his honesty. Unlike, say, Barry Bonds, Mark McGuire, or even Roger Clemens, he’s not asking us to leave him alone. He is still begging us to believe him and to support his causes. We maintain our interest in this retired athlete’s increasingly distant active career largely for this reason. Although we cannot be sure of whether Lance is telling the truth or lying, there is a fact of the matter that is known for sure by only one person (Armstrong himself) if he is telling the truth; and by several people at least (including Armstrong himself) if he is lying. No “outsider” (that is, you and I) has grounds for complete confidence in our beliefs about whether he used. But both sides can make a case for why it is reasonable to lean, perhaps heavily, one way or another. Those who believe Lance seem to be relying on some combination of the following: (a) the fact that he never formally failed a drug test; (b) the belief that his denials are credible, as far as we can see in his face and voice; (c) the belief that a man who has done so much for charity must either be too good to cheat and lie about it, or at any rate, has earned the benefit of the doubt; (d) the belief that there is a grand witch hunt and conspiracy to bring Armstrong down — one that involves acts and omissions from a large number of seemingly unconnected people, all of whom allegedly have personal reasons to conspire against him. Again, whether Lance is telling the truth or not, these are all rather shaky grounds for a strong conviction that his is. Concerning (a), at least one of Armstrong’s samples was retrospectively found to test positive for EPO, although an independent investigator, as Barra puts it, “called into question the lab’s handling of confidential samples.” There may be no other “physical” evidence forthcoming, though if there were, one suspects that supporters would find conspiratorial explanations more compelling than the evidence. In any case, it goes without saying that many long-term users of PEDs, including Marion Jones, passed every test. Many of Armstrong’s fellow cyclists passed every test for years before they got unlucky. Passing these tests simply cannot destroy all grounds for skepticism (as Wired magazine explains here.). As for (b), Lance’s supporters — including myself for many years — absolutely wanted to and did believe his repeated denials. But none of us is as much of an expert in lie-detection as we would like to believe. I believed the denials by Bonds, McGuire, Jones, Ben Johnson, and others too. Even Bill Clinton’s. And we mustn’t forget that by throwing in the towel last week, Armstrong and his legal team denied us the opportunity to employ our keen powers of psychology to judge the credibility of the witnesses under cross examination. (Was this hearing going to be televised? If not, there would surely have been video available soon after.) Again, this is not to say that Armstrong’s denials are lies, but only that we can’t base unshakeable beliefs on them. I suspect that many of Armstrong’s strongest supporters believe something like (c): that nobody who had worked so hard for good causes could also be a cheater and a lier. What can I say? I don’t share that rosy view of human psychology. Good people do bad things. Some of the “greatest” individuals in history have had very complex, seemingly contradictory personalities. And sometimes one badish thing that might be necessary to keep the good work going ends up leading to more and more. Finally, I would say the stronger a person’s support is based on beliefs in (b) and (c) — that is, in Lance’s being a virtuous man whose denials seem credible — the stronger the motivation to find explanations for why everyone who wants to testify against him or ruin his reputation is liar, not to mention small-minded, jealous, and evil. We know even less about any of these people than we know about Armstrong, and yet Lance’s supporters do not hesitate in impugning their motives. I don’t know much about any of these people either. But I am suspicious of conspiracy theories that involve such a broad array of unconnected characters, many with no obvious motivations to take down such a hero (they are not all getting immunity from punishments themselves). Again, none of this shows that Armstrong used and lied about it; but it does make it hard for me to understand how any of his supporters can have rational grounds to feel as certain as they seem to. In a very true sense, only Armstrong himself is entitled to know for sure that he’s clean (if he is clean, that is). (ii) If Lance supporters are convinced that good people don’t do bad things, the skeptics lean heavily on the gut feeling that where there’s smoke there’s fire. Especially with smoke escaping from so many different places. It’s not really an argument, and it is the kind of reasoning that has convicted many an innocent suspect in the absence of physical evidence. But the credibility of multiple eye-witnesses goes up to the extent that at least some of them seem credible, and to the extent that “vast anti-Lance conspiracies” (to paraphrase Hilary Clinton) seem implausible. (iii) It appears that a number of leading sports journalists, including people who have known Armstrong for years, consider that with last week’s announcement he has, in Samuel Abt’s words, “implicitly admitted his crimes.” So many others, including the long-time supporters, were shocked that the consumate, tireless, fighter suddenly stopped fighting. This is a “howling red flag to me,” Roy Firestone said a number of times on the Patt Morrison radio show last week. And again, we can’t ignore that he stopped right before he and his lawyers were finally about to have the chance to cross-examine the witnesses against him. (Am I wrong about that aspect of the ASADA “public arbitration hearing”?) One explanation for the move, three days after the federal judge refused to stop the proceedings, is the one Armstong gives officially: “There comes a point in every man’s life when he has to say, ‘Enough is enough.’ For me, that time is now.” Another explanation is that he and his legal team calculated that the witnesses would appear credible in both the hearing and to the wider public. I know who won those seven Tours, my teammates know who won those seven Tours, and everyone I competed against knows who won those seven Tours. We all raced together. For three weeks over the same roads, the same mountains, and against all the weather and elements that we had to confront. There were no shortcuts, there was no special treatment. The same courses, the same rules. The toughest event in the world where the strongest man wins. Nobody can ever change that. As a matter of fact, I completely agree with the claim and the sentiment here. He was indeed the greatest. But what is striking about the passage, coming as it does near the end of his statement, and after five paragraphs of denouncing those he saw as leading a witch hunt against him, is the solidarity with his fellow riders. Note what he doesn’t say: he doesn’t say, hey, all those guys right behind me were subsequently discovered to be juicing! But I still won! No. In fact, he considers they were all on a level playing field. No one took shortcuts, everyone followed the same rules. He won, and the other riders fully accepted that. Now to me, this looks quite plausibly like a diplomatic “implicit admission.” That it was well understood by all the riders that the use of certain PEDs was “permitted” by the “rules” they all followed. It created a higher level playing field, if you will, but still a level playing field. And in many ways, I can respect this. If the regulators of a competition lose their ability to ensure compliance and punish cheaters, it is more and more difficult to blame those joining the “cheatfest,” so to speak. (I can’t speak to the “health” implications of this “higher” equilibrium. EPO has been linked to cyclists dying in their sleep when their heart rates drop too low; although, if I’m not mistaken, cycling at that level has always led to a shortened life expectancy.) We might also pay attention to the second sentence of his announcement last week. After “enough is enough” he describes the charge that sticks in his craw this way: “I have been dealing with claims that I cheated and had an unfair advantage in winning my seven Tours since 1999.” Note that he doesn’t say I have been dealing with claims that I took PEDs. He seems to believe he can honestly deny is that he cheated and that he had an unfair advantage. And you know what, this actually has Colbert’s truthiness wrapped around it. In that world, the taking of EPO didn’t give you an advantage, let alone an unfair one; and therefore it was arguably not cheating — at least not among the fraternity of riders. Nowhere in his 868-word final statement (in which, by the way, he also announces “I will no longer address this issue, regardless of the circumstances.”) does he actually say, “I never used PEDs.” Only that he passed the drug tests and he didn’t cheat against his fellow riders. Of course, this bit of hermeneutics about the interpretation of Armstrong’s first and last words on his cycling legacy does not give us certainty that he did indeed take PEDs. As outsiders, if Lance is innocent, we will never ever know that for sure. If he is guilty, we will probably only know for sure if he confesses a little more explicitly that he does in the above statements. If he is innocent, then this whole sordid process amounts to one of the greatest travesties of justice in sports (at least in America) since era of the color barriers in various sports up until the 1940s and 1950s. And if he was in fact using illegal PEDs? What then? (If you’ve lasted 3000 words into this piece you are probably not saying “So what!” or “Who cares? !”, though that reaction is available.) In that case, we have to assume that Armstrong has decided that he has a sizable enough following of true believers that his reputation can still be leveraged for the good of his foundation within that shrinking circle. Again, if he has been lying about his drug use, then that is a good way of interpreting the intentions leading to his surprising moves last week. He may have been using cost-benefit analysis and utilitarian reasoning all along: that what matters most is maximizing the impact of his foundation, and that requires doing and saying whatever is necessary to preserve the faith of those who admire him and his brand. But on the scenario that he did use PEDs on the Tour, then we probably want to judge that the moral misdemeanor of doping in that doped-up sport is not really the most important ethical issue at play. In fact, that paragraph of his, quoted above, already sketches out the lines of a partial justification, or at least explanation, of that activity. But if it transpires that he was doping, then by far, by far, the bigger issue for Armstrong’s credibility, reputation, and brand as a social and moral leader in our society — for that is not an exaggeration of the stature he has or had assumed — is the fact that he has repeatedly looked America straight in the face and lied. He has also actively impugned the character and reputations of individuals who have dared to speak out against him. If he is completely innocent of the doping, then all of those actions are perfectly legitimate. But if he is not, then the doping per se is really the least of the issues for which he owes general and specific apologies; and we have to hope that his people have a way of getting in touch with Marion Jones’s people… and that last Friday’s statement was not really his last word, under any circumstances. Are women's sports "separate but equal"?